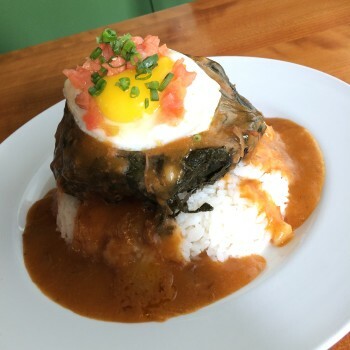 Along with my foodie friends Melissa, Sean, Ryan, Brandon, Kimberly and a few others, we were given the opportunity to taste Highway Inn’s “hidden” loco moco menu and of course we couldn’t pass up the chance! 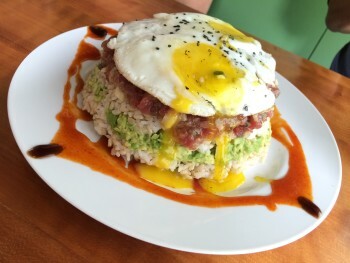 The first dish we tried was the Smokin’ Moco. This is actually on the regular menu, but luckily Highway Inn President & CEO Monica Toguchi overheard my conversation with Kim (in a series of small growls and broken Yeti-speak) about how awesome the smoked meat was at Highway Inn and she decided to spoil us! 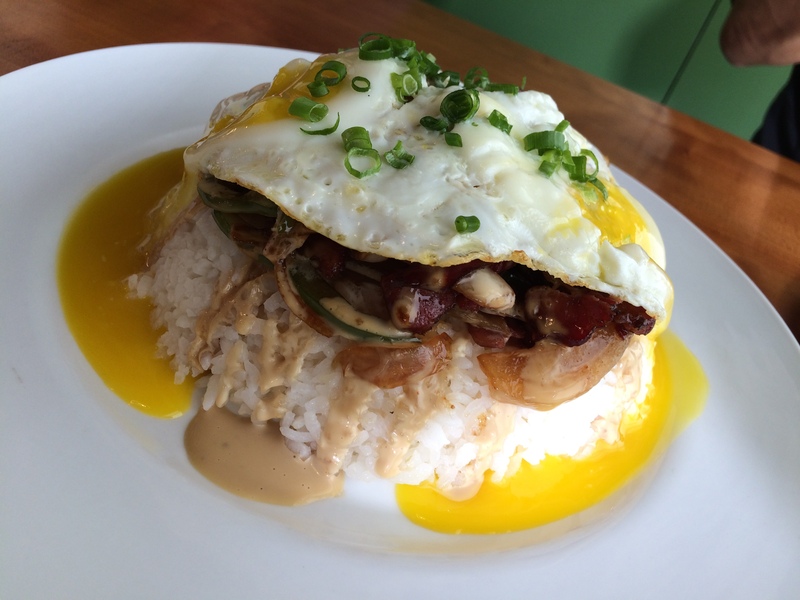 The Smokin’ Moco is every local’s dream: Highway Inn’s signature smoked meat with caramelized onions, peppers, special sauce and covered with two sunny side up eggs over a bed of rice. It was definitely a struggle to share…luckily I’m bigger than everyone else. The first Moco served up from the hidden menu was the Ahi Tartare Moco. Visually, the dish was beautiful with a variety of colors highlighted by several ingredients, including the black truffle salt, Sriracha and avocado. The Ahi Tartare tasted best when we mixed everything together rather than eating it in layers. 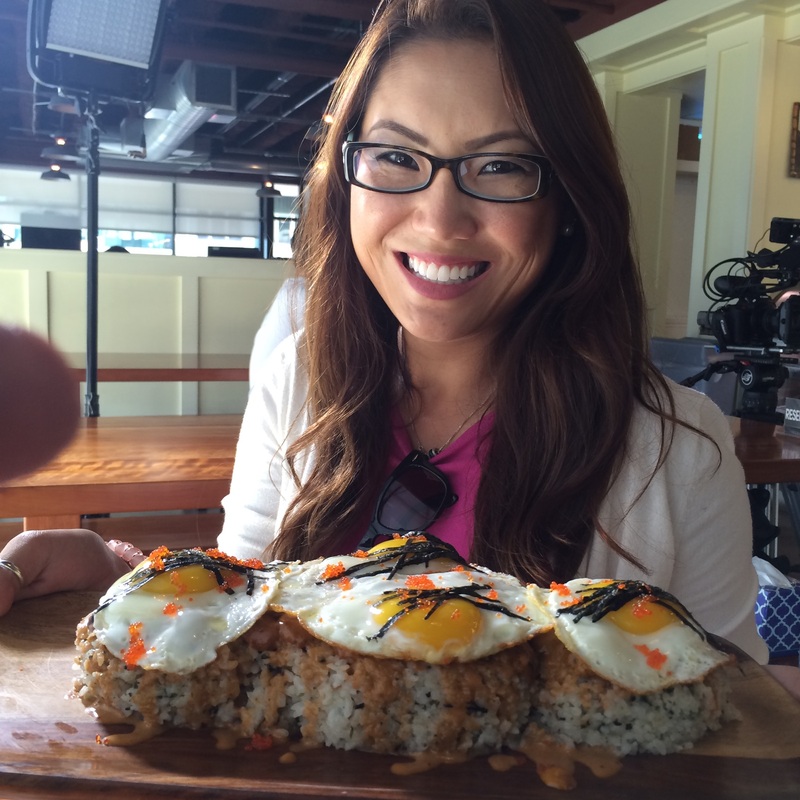 In a sense it was like eating a spicy tuna roll without the nori. The Highway Inn Hawaiian Moco was an eye opener. It’s probably the first time I’ve seen something like this, yet it seems like someone should have thought about doing this before. After taking my teaser bite of the Hawaiian Moco, it was a free-for-all for seconds. I had to arm wrestle Brandon and ambush Melissa when she wasn’t looking for a few more scraps. Luckily Ryan is half my size so he was easily intimidated. Try tasting something composed of a bed of rice topped with beef stew, a lau lau, sunny side up egg and covered with some lomi lomi salmon. It was like a wake-up call for my appetite. And it’s pretty obvious, next to Sean, I’ve got the biggest one! Last but definitely not least was the I Wanna Vanna Moco. Words can’t explain what I was tasting in this dish because you probably wouldn’t believe me. Included is a bed of furikake rice, smothered with fresh Uni caught earlier that morning off Waianae, topped with some kind of secret Uni sauce, which I feel was purposely made addicting by Chef Big Mike. To complete the meal, nori and tobiko flakes were added to the eggs. Pictured to the left, Kim posed for us with the dish before she decided to run off with it. Luckily my legs are much longer than hers and I was able to get my share. 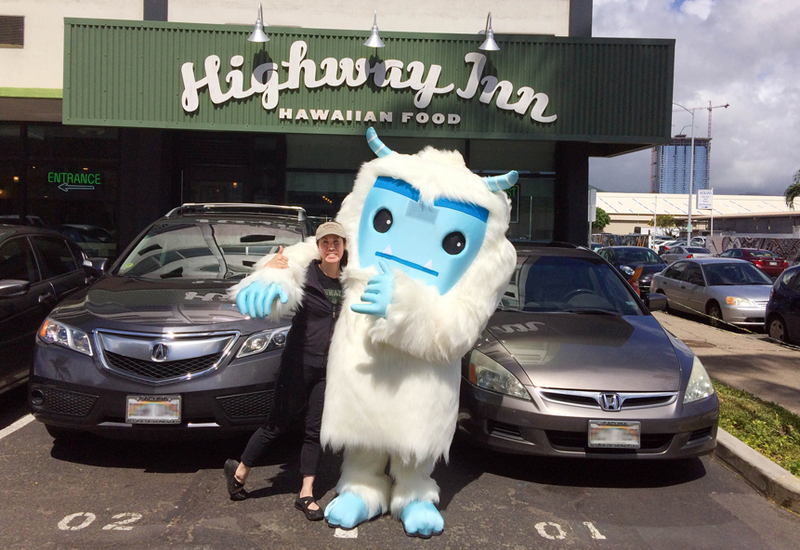 As Hawaii’s only FREE online job board, Real Jobs Hawaii takes great pride in our commitment to job seekers and our emphasis on highlighting real local employers, just like Highway Inn. Don’t bother sifting through spam and scams, connect with us and let’s work together to find you the right job.